Whoa! Déjà vu! 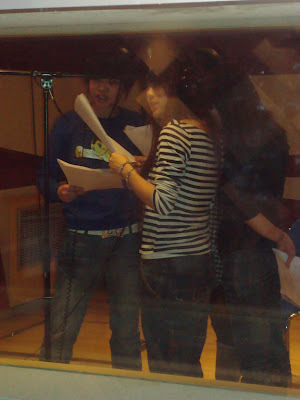 Are they recording the voices for Boom Chiki Boom! again? That was already posted before on this blog, wasn't it? Oh. Wait a second! They are speaking Mandarin, not English! Aha! 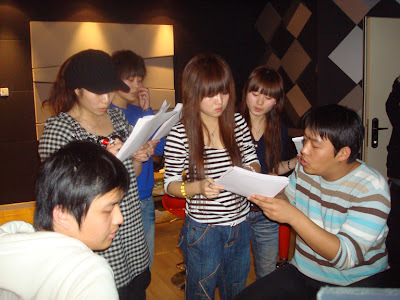 This is the recording session for the Chinese version of Boom Chiki Boom!. These young woman are recent graduates of acting school. And skill definitely shows! Their voice acting is excellent! Adapting the Korean songs into Chinese can be really tough, but a little coaching can help with that. Wow! 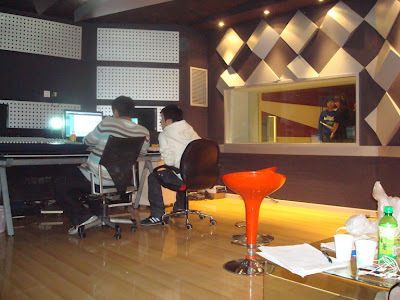 This Beijing recording studio is much more spacious and fancy than the one in Seoul. 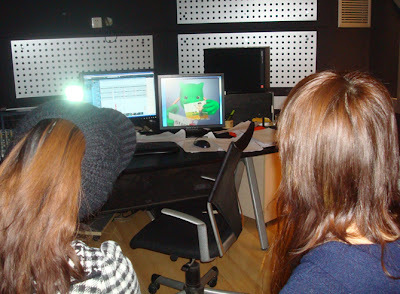 After a long day of recording, they get to review their work (that's the best character, A-do, on the monitor above). Boom Chiki Boom! is a perfect example of OSMU, One Source Multiple Use. It's a CG animated show. A live-action costume television show. A stage show. And it is easily exportable into multiple languages. This Chinese Boom Chiki Boom! recording session shows how Korean content can reach a market larger than the Korean Peninsula alone. Sitting in on this recording session also demonstrates how amazingly identical an experience can be, even if it occurs in two different countries. 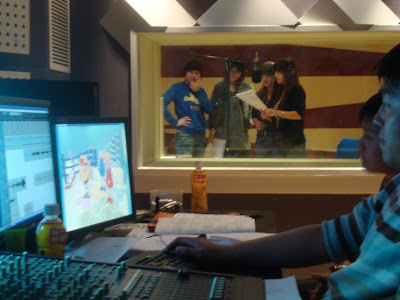 The exact same challenges faced both sets of recording sessions, such as the lyrics being too long for the music or confusion about certain animated parts in the script. Even the Chinese staff members had similar personalities and habits as their Korean counterparts! How can I learn more about OSMU?